Philippine Christmas is not Christmas without caroling. Carolers visit houses singing Christmas songs in English and Pilipino to raise funds for a youth and church project or for any other purpose. With the advent of the Karaoke and the one-man band, caroling in the Philippines has gone high tech. At times instant Christmas dance parties are held at the hosts’ request. Hamon (ham), lechon (roasted pig), fried chicken, adobo, embotido, queso de bola among others make a scrumptious Christmas dinner called noche buena. For desserts take leche flan, ube, cassava cake and other native delicacies. The noche buena is an occasion for a family get-together, some coming from the provinces and abroad to partake a sumptuous meal after the midnight mass on Christmas Eve. 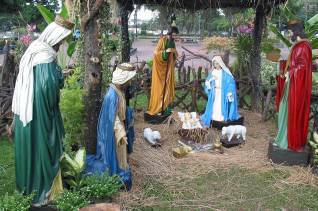 The Nativity or crèche (Belen in Filipino) is a popular Christmas scene in parks, front yards and churches during the holiday season. The life-size statues above depict the visit of the three wise men known as the Magi on the Holy Family. Picture was taken at the Luneta Park in Manila where the Philippines’ national hero, Dr. Jose P. Rizal, was shot by Spanish musketry on December 30, 1896 two years before the American Forces liberated the country from Spanish rule.